For reference to what Cage’s studio is all about, check out POST # 149 JOHN CAGE’S STUDIO. I was at South County Art Supply (I know I mention them a lot, but you do a Creative 365 where else would I be hanging out?). I was complaining about my Golden Acrylic paints. You see, I don’t know if it’s just me being a super messy- spastic painter or if other artists have this problem? The problem is, while I’m working on a painting, I have to constantly add more paint to my palette. So what -you are thinking? Well, imagine you have three hours and it takes a minute to open and close each tube of paint x 12 paint colors. One could very easily spend 20-30 minutes constantly tinkering with the paint. Well, I always feel short for time. So first it was just that I left all the caps off while I was working, then paint dried in the caps and on the threads of the tubes and they just wouldn’t close anymore. Then each tube was officially dried out at the top, so I had to take a knife and pick the dried-up paint out. Total time-buster! Let’s just say the caps are gone now thanks to Willow. So it’s just that I’m a sloppy painter? Well, Andrea rocks for this very reason. She researched and found a solution and special ordered me an alternative. We knew that the less expensive student paints came in flip-top caps, but what if you wanted a high quality professional paint? My original problem was with the Golden tube paints. Andrea found me the same paint manufacturer but different bottles. How could someone write a blog about something so ridiculous? What? It really was irritating me! Now the problem has been solved and I’m a happy painter! Oh man, am I going to get it! and Jane just opened a framing store right on Main Street http://finishingtouchesri.com/. I worked as a picture framer for 2 years right out of college and then for 5 years through my family business. I learned a lifetime of information on conservation, retouching, refurbishing, interior design, art history, mathematics, customer service, creative design and to always make sure the focus is on high quality and fine craftsmanship. I dishonored my family by entering a big box chain and purchasing stock frames. South County Art Supply is having their 1 year anniversary. I am so psyched they are in South County. Andrea, the owner welcomed me to display some of my 365 artwork during the festivities. This is an honor especially after they have so graciously sponsored me through my whole journey. So,I need to display a bunch of art last-minute and I can’t get to New York to see my mom. Well, I knew I couldn’t get custom mats made in time, nor do I really have money to buy custom mats since I am pretty much working 9-5 doing a 365 challenge for no pay. I’m scraping here! So as a framer, what could I do? -GET CREATIVE! I decided to float my art. This is where there is no mat board with an opening, instead the art sits on top of the board, hence the “floating” in the center of the frame. But what if your art work has unfinished ugly edges? Well, I came up with distracting my audience. I went to the fabric store and bought a couple of yards of different fabrics and decided to wrap the cardboard. Actually, I went to South County Art Supply and bought foam core because it is easier to stretch the fabric on. I used stainless steel pins instead of tape so it doesn’t yellow my work. And this is what I did all morning … stretch fabric, pin it, fit artwork into frame, stretch fabric, pin it, fit artwork into frame….on and on…. By the way, I left the Windex bottle in the photo so you could have a gauge of how large some of these pieces are. Pretty amazing I painted most of these in one day!!! These frames don’t even hold a candle to custom frames. They are just plain black and white frames, but the fabric really give the pieces personality. I just love the Madras plaid fabric. It makes a very traditional still life funky. I guess that is sort of my style -traditional funk! OK. So down below is a flea market find painting of some carolers. My mother bought it for me years ago because she thought I’d think it was kitsch…I don’t know, I have always had some problems with it. One is that the girl to the right looks like Katharine Hepburn and two, is the mouths. Maybe they aren’t carolers, maybe they are a bunch of bullies picking on some little kid who they won’t let join them. Right? Don’t they look like they are mean? I guess that is the kitsch part, but it’s just so weird…. Well, I held onto that caroling painting for many years. The reason being – I loved the frame! Today I put one of my own paintings in it and I just love it. The gold fillet on the inside of the frame sparkles like jewelry. This is a custom frame and it’s absolutely gorgeous. You know it gives me a lot to think about, who is responsible for the framing? The artist or the art buyer? The reason I didn’t want to try to sell any work during this 365 was because I’d then have to worry about time to frame, display and all other matters of that kind. It is a real time-sucker and it costs a whole heck of a lot of money! I think I will have to compromise and do a little bit of everything. I can’t frame over 200 paintings to the nines, but my mother has already started to collect my most “stellar” pieces and these we will frame beautifully. Then I will have art that is still really cool but not very “mainstream”. This I will probably have to frame by any means necessary and then there will be my complete failures. Those will go in a bargain bin where someone might buy them, later on in life sell them for $2.00 in their yard sale and then someone else will receive it as a gift and wonder what in the heck the painter of that painting was thinking! It is all full circle! You are going to have to forgive me for rushing through my post part for today. I am attempting to do two things at once. This morning I took a 2 hour drive to get to a fabric store to purchase fabric for some art I am framing. I will frame it tomorrow and photograph it, so you can see what I am talking about. The second thing I did today was begin an 18″x24″ painting of a windowsill in the composer John Cage and choreographer Merce Cunningham’s West 18th street apartment. Really, the painting has nothing to do with those artists. 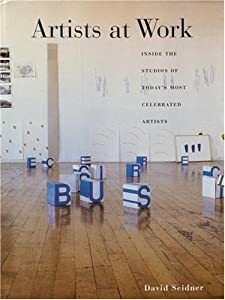 It just so happens, I was reading the book “Artists at Work –Inside the Studios of Today’s Most Celebrated Artists by David Seidner. Something about these plants really appealed to me. Throughout the week, I kept coming back to this page. I thought, what the heck, why not try to create an abstract painting from it? This was my first layer of paint. It loosely reflects the view outside the NYC apartment. next I added the wild stems, pots and leaves. It looks a little off now, but I plan on adding lots of different colors and textures to the stems and leaves. It’s going to be a color study of reds and greens. One of my favorite color combinations. So check in tomorrow. I should have some art pieces framed and hopefully finish off this painting. Wow, I’m feeling a little disoriented. The weekend ended and I moved right into pottery class! Today I had lot’s of things that needed trimming. This is where you flip all of your vessels upside down on the pottery wheel and clean up the bottoms of your pottery. You need to create a thin rim for your vessel to stand on while also creating the smallest surface possible to prevent glazes from sticking to the kiln. I had seven pieces to clean up, which took most of the class. Then came the fun part, decorating and embellishing. I went a little nuts on the bowl up above creating dots. I just love the way the glazes break over the dots and leave little pools of glaze in their centers. I dotted up a handle-less mug as well. Dots were definitely my thing today. As was decorating some more of these little bud vases I’ve been creating. On two of these mini vases I created patterned medallions. They give me an Asian-deco vibe. And the last three I dedicated to flowers. I just can’t get enough. Now I will still get to enjoy flowers even when they are empty. All of these will soon be bisque fired and then I can start adding some of that color I love so much. Stay tuned to see these pieces evolve! Today was a glorious day. Today was also my birthday! I woke up to sun and not rain. For this I was incredibly grateful. I took a nice hot shower and tried to clear my head of the nasty cold inside. It worked for the most part. I did start feeling better. My darling husband baked me a homemade loaf of bread for breakfast and for the first time this spring, we enjoyed a meal outdoors. The air was crisp, the sun felt warm. It felt great to be alive! Next we walked into town for the Memorial Day Parade. For the first time in my life, I really feel like part of a community. The kids and I waved to everyone we knew as they marched by. It is so cool to be part of a small town! We came back home and each of us did our own thing for a while. It was very peaceful. My daughter read, my husband and son played a game and I painted a landscape watercolor outdoors. and to finish off the day, we walked back into town to meet up with some old friends for great big ice-cream cones. They were even thoughtful enough to bring a candle and sing me happy birthday. I had no grand plans. I accomplished no grandiose tasks. Instead it was a quiet day. A peaceful day. It was sweet & simple. And I couldn’t have asked for anything more. This morning I was back at it creating some more logos for “Lands Stewardship Center of Rhode Island”. I’m not sure what they want, so I like to have a bunch of ideas in the beginning to work with, so we have a stepping off point for the final logo. It’s as simple as that. You can refer back to Post # 144 for the back story on the assignment and details. I’ve been at it since 7:30 am which is more than 4 hours. So I am ending this session abruptly so I can spend the rest of the day with my kids. I find if mom zones out, the kids zone out. It’s time to get them off the couch and out into the wilderness or at the very least their suburban back yard! Meet the new addition to our family, Willow. A week ago we picked up our new cat from the pound. We went every day for a week to spend time with all of the cats to make sure we found the right cat for our family. We fell in love with her instantly. This past October we lost our previous cat of ten years during the hurricane. She left and never returned. This new cat came with the name Carissa, but we wanted more of a “cat” name than a human name, plus she didn’t have the name Carissa for long, it was the pound’s pick. I think it was my mom that introduced the name Willow. It is an easy name when calling for the cat. It’s not really a human name. It’s Purrfect! During the hurricane, a tree fell in our yard. It was a beautiful very tall tree and I was really sad to lose it. During the storm clean up, I stuck one of the fallen tree branches into a garden planter as I walked by. To tell you the truth, I don’t even remember doing it. This spring, I looked out at the planter and there were buds on the branch. It is a willow tree. So although we encountered loss during the last hurricane, there are many ways that we are still experiencing life. We welcome our new little kitty Willow, with open hearts. Ya know, there’s a funny little story to this painting. Apparently they were at a really expensive resort in Mexico. This bowl was in there hotel and they just fell in love with it. They told me they spent the whole week shopping the bazaars looking for a bowl like the one in the hotel and they just couldn’t find one. The vacation came to an end and I guess they just couldn’t part without it. This just cracked me up, because all of us have a similar story. You know, we are all “good” people. We would never steal from a store or a friend’s home or anything horrible like that, but at least once in your life, you just can’t part with something. I have two of these stories. One of them is about Stella Artois beer glasses. I just love them. Their beer glasses are shaped like a wine glass but for beer. Is their anything more perfect? I am not saying much more. I have no idea how a Stella Artois bar glass wound up in my cabinet. That is all I am saying about the subject. No idea. My other guilty confession is about a rock. I can’t believe I am confessing this to the world, but what the heck. Take a good look. It’s a rock. Yep. Plain and simple, but for some reason I felt such a strong compulsion, I just had to have it. I was on summer vacation at a beach house rental and this rock was on the vanity in my room. I found this rock absolutely irresistible. The lines on it almost look like tree lines. They are perfect. Each day I’d get ready at the vanity and admire this funky beach rock. I live by the beach, it is not like I can’t go out and get hundreds of rocks. In fact, I do. I have quite a large beach rock collection. By the time my vacation was up, I just felt like I had to have it. I’m always a little haunted. I justified my heinous act by thinking “Ah, I’m sure it was just another renter who placed it there”… But what if it wasn’t? What if some little old man just lost his wife to cancer and he sat on the beach sobbing and picked up that rock and every day he stared at it reminding him of the love for his wife. What if that rock had been on that vanity for 20 years and I ruined it? I’ve got a great imagination don’t I? Let’s face it, it’s a rock! Anyway, my friend’s story of the stolen bowl reminded me that we are all human. Good most of the time and kleptomaniac the other! Now if you happened to have a bowl that you thought was so great you just had to steal it, would you really be dumb enough to leave it at someone’s house after a party? This is Day two of this 22×28″ still life watercolor. I am trying a technique I have never tried before. I created all of the shadows first and now I am adding the color. I’ll tell you, I am usually the dummy trying to add shadows at the very end and all I wind up doing is muddying up and distorting the whole painting. Adding them first makes so much sense. However, next time I will not apply the same color shadow for the entire painting (In this painting it is all the same blue). Some shadows are warm, some shadows are cool. I often like to use a color’s compliment in the shadow like yellow/purple, red/green, and blue/orange. Which I didn’t even consider this time around…So much to remember, but I am slowly catching on. For all of you non-artists out there, I am sure I sound like I am rambling, but the point I am trying to make is there is so much thought, calculation and science that goes into making a successful painting. I’m pretty sure it will take a lifetime to figure it all out. A lifetime of mistakes and with each one, a new-found insight. I guess if it were easy, there’d be no challenge in figuring it out right?